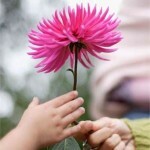 MASadvise.org > Blog > estate planning > Why are donors interested in estate gifts? 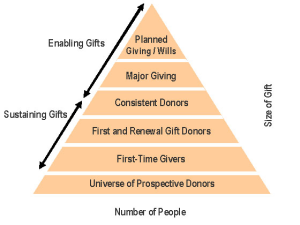 Why are donors interested in estate gifts? What motivates a donor to make an Estate Gift? Estate giving donors want to make a difference! While many individuals might want to be a major donor, many cannot afford to do so in their own lifetime. However, they recognize that a bequest gift can allow them to make a significant impact. Most estate gift donors feel that their current giving has made a positive impact and they desire to continue making a difference after their death. Estate giving donors usually have a deep personal connection with the recipient charity. They are typically long term loyal donors (not necessarily major donors), supporters and volunteers who have usually been directly or indirectly impacted by the work of the charity. Or they may have a family history or connection they wish to recognize through an estate gift. Estate Gifts are an “ultimate” gift from an individual and represent their personal values and alignment with a charity. 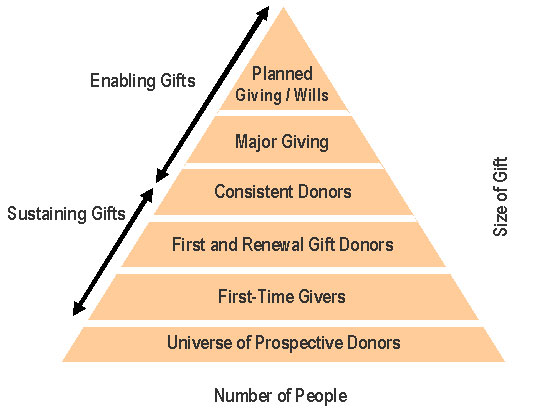 The “donor pyramid” below demonstrates where estate gifts fit into a donor’s lifetime of giving.